We've just made a new update to some minor features that people have been asking for. They are a grid layout and the ability to switch between private and public desktops. A lot of people really like to see stuff in straight lines. So we built a new feature called SNAP TO GRID. This is a little blue button that appears in the bottom left corner of your desktop when you are in EDIT mode. When you select SNAP TO GRID, a blue graph paper overlay will appear on your desktop. Now any content you drag and drop will automatically line up with the grid lines (top left corner of your content to be exact). Just get close and the content will automatically snap to the grid. You should now be able to organize your content in columns and rows quickly and easily. Lots of people really wanted to be able to switch between creating a desktop in private then making it available to a broader audience. Previously you could only select one state for your desktop. To change between a public or private desktop, go to the desktop settings and select the check box beside PUBLIC. If it's checked, the desktop is available to anyone who has the link to your desktop. 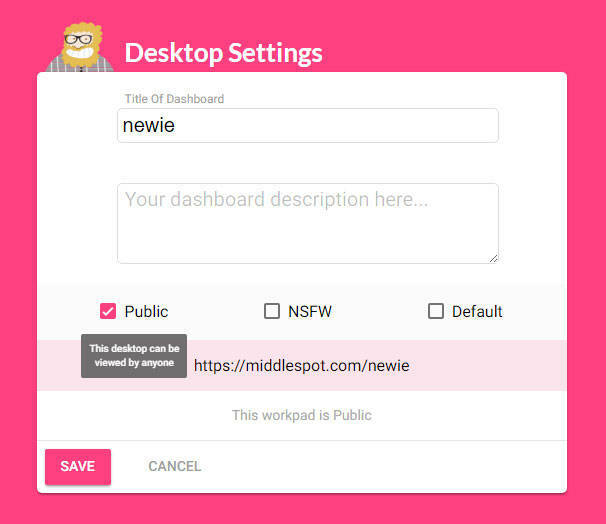 If it's not checked, your desktop is PRIVATE, and only those who have a middlespot account and that you invite to view or contribute can access your desktop. You can switch back and forth as often as you need. Stay tuned, we have a huge feature update coming at the end of this month that I think will appeal to a lot of people who like to keep what's important as close and easily accessible as possible. Thanks again, and please use our feedback tool to help us keep improving middlespot.